Toronto is a megapolis with a lot of businesses and a lot of signage. It all comes from thousand sign companies located in Canada and the U.S. The market is highly competitive and only the best actually have a fighting chance of succeeding. You need to have the best designers, sales and production people to get it done. Not that easy to have great graphics installers in staff. Why? Because an installer of our level can handle all the installation jobs for 5-6 mid-size to large printing companies. So let's say he is working full time for one company - he is probably doing nothing at least half the time. This is why guys like we exist. Our strong belief is that people from a sign shop should do what they are doing while we are taking care of challenging vinyl applications, wraps, site checks, traveling across the province and getting our hands dirty. We excel in what we are doing every day. We know how to handle pretty much any type of installation out there from a small banner to a huge office building full of directional signage. We are not on the clock so we work late nights, early mornings, weekends and holidays making sure the client is happy. 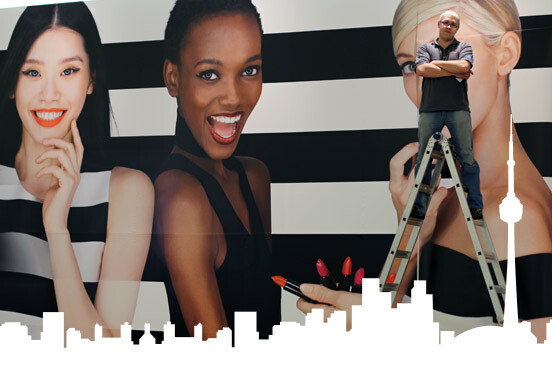 What is the dream of a large signage company? It is to get a couple of big national retailers accounts. Well, we serve around 50 such accounts all across Ontario. This is a big fortune but also a big responsibility. We can't afford making a mistake or missing a deadline on any jobs! The return trip rate because of our installers' mistakes is close to zero. How we achieve this? Not a single guy with less than 10 years experience in the business will ever work for us. We believe in theoretical and practical training which gets omitted by many competitors. We've been trained and certified by all major companies like 3M, Avery Dennison and Arlon. We guarantee the results! We never get paid up front and never will leave a client not satisfied. I probably not need to mention that we are insured. With all this we have been authorized to work in all the downtown Toronto office towers and all malls across Greater Toronto Area by property management giants like Oxford or Bentall Kennedy. This is the seal of approval in this business! Toronto Sign Services is not the biggest sign installation company and we are not a do-it-all gang either. We specialize in certain types of graphics and signs installations only. But the things we do, we do not just well, we do them better than anyone else! Give it a shot! Try us on one of your projects and you will not regret! First sign installed in 2002. Formed as an independent installation company in 2009. 6 full and part time certified installers with combined experience of over 100 years in signage business! Currently performing around 1000 installations a year. About 200,000 sq.ft. of vinyl installed annualy. More than half of all our orders come US based clients. We serve a lot of global companies. Major share of all our installations deal involve vinyl graphics and window films. Less than 1% reprints are caused by our installers' errors. We are in this game for a very long time and we need our clients to be happy! In many things Toronto Sign Services is the best or the first. First company in canada to become PDAA Master Certified for example. here are some interesting numbers from our long experience in this business. Max square footage of vinyl once installed in one night by our crew. Average year mileage per installer. The highest floor we ever installer signage on. Hours without sleep during one continuous installation project.